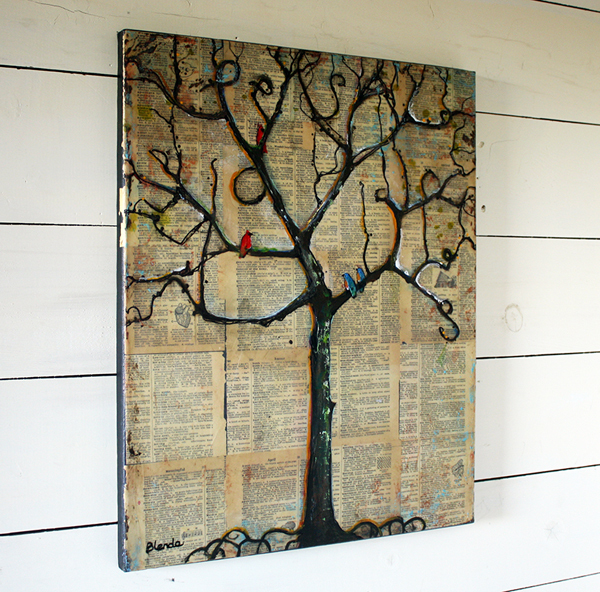 I've been painting more trees from my popular "Lexicon Tree" mixed media series. This painting, called "The Gathering Place" is a winter version or---- possibly early spring before the leaves turn green. You choose. It was inspired by the persimmon tree that grows right outside our back door. Every year in early autumn, when all the leaves are gone, birds of all shapes and sizes flock to the tree to eat juicy ripe persimmons still clinging to bare branches. The birds on this tree are satisfied and happy from eating persimmons until there aren't any left.